Microsoft customers clamoring for the incorporation of the Start button and menu into Windows 8 will get their wish partially fulfilled in the upcoming update of the OS. Windows 8.1, which will be released in preview mode next month and in final form later this year, will not have a Start menu, but it will have something very close to a Start button that'll trigger several key Start menu-like features. A main target of complaints about Windows 8 have been its two user interfaces: the radically redesigned "Modern" one based on tile icons and optimized for touch screen devices like tablets; and a traditional one similar to Windows 7's for running legacy applications that nonetheless lacks the Start button and menu. Critics have said that the Modern UI requires a steep learning curve for the average user, and that even the more familiar traditional desktop interface can be frustrating to navigate. In addition, toggling between the two interfaces is seen as awkward. The interface issues have been a concern particularly among some business customers worried about affecting their employees' productivity. But Windows 8.1 adds a Start-like button, as well as the possibility to view all the applications installed on the device and sort them by name, date installed, most used or category, Microsoft announced on Thursday. The OS update also will allow users to boot directly to the traditional desktop interface, whereas before the Modern interface was the default and primary one. It will also be possible for users to have the same background image or pattern both on the Start screen of the Modern UI and on the traditional desktop interface in order to smooth the interplay of the two interfaces. Clearly, Microsoft is trying to address the interface complaints in Windows 8.1, according to Michael Silver, a Gartner analyst. "It's not bad to experiment. It's not bad to make mistakes. But it's very bad to not listen to your customers," he said via email. The experience doesn't replicate the Windows 7 Start button and menu, but it's an improvement over Windows 8, Silver said. "The Start button will not bring you a vertical list of applications and commands" like the one in Windows 7, he said. "But if you're on the desktop, it won't bounce you out of that environment. It will bring the Start screen on top of the desktop. It's really kind of nuanced. All the elements of Start won't be back, but it won't feel as jarring." Grafting the Windows 7 Start button and menu onto Windows 8.1 wouldn't have been a good option, he said. 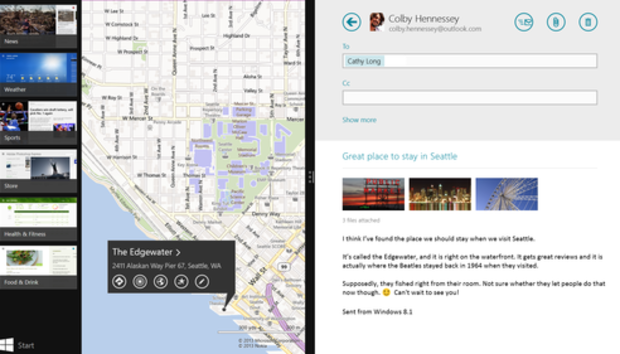 "Microsoft needs to get people used to the new interface. They tried forcing it on people and that didn't work. To bring back the old experience would probably have left the new UX [user experience] and apps too hidden," Silver said. Other changes in Windows 8.1 include an improved search capability powered by the company's Bing engine that will return results from a variety of sources, including the Web, applications, local files and the SkyDrive cloud storage service. Windows 8.1 also brings more options for seeing multiple applications on the screen simultaneously, including the ability to resize apps, for improved multitasking. The OS update also lets users save files directly to SkyDrive. A new version of Microsoft's browser, IE 11, will ship with Windows 8.1, featuring faster page loading and better performance in touch screen mode. Overall, Windows 8.1 "is closer to what they should have put out as Windows 8.0 and probably closer to what they would have put out if they had had more time," Silver said. The Windows 8.1 preview will be released at Microsoft's Build developer conference, which runs from June 26-28. When it ships in final form later this year, Windows 8.1 will be a free update for users of Windows 8 and of Windows RT, the OS version for devices that use ARM chips.